Vocals! courses are fun weekend singing events for children of primary school age. They regularly attract up to 200 singers. There are no auditions. 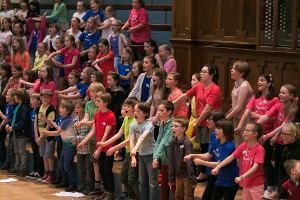 The children are carefully supervised and conducted by specialist leaders who have a fun approach to singing and give everyone the chance to perform a variety of music in a friendly and secure atmosphere. Copies of the music and a rehearsal CD are sent to you before hand so that you can begin practising in your own time. December 2018 – Christmas is Coming! May 2019 – Vocals Weekend & Concert – Booking now open, click to find out more!